Area 88 (エリア88? Eria Hachi-Jū-Hachi) is a Japanese manga series by Kaoru Shintani serialized between 1979 and 1986. The story is about a young pilot named Shin Kazama and his experiences at Area 88, a mercenary air force base secluded in the desert of a war torn country. Shin goes from head of his class at a world-renowned aviation school dating the beautiful daughter of an airline president to a mercenary fighter pilot bound to Area 88 by a three-year contract that he was duped into signing by a jealous and competitive childhood friend. Determined to earn $1.5 million to buy his way out of the obligation and return home, killing becomes second nature to Shin as he quickly rises to the top rank at Area 88. Overwrought with shame and self-loathing for what he has become, Shin begins to question whether he is still fighting for survival, or like his fellow mercenaries, for the sheer excitement and camaraderie of battle. A bit more background on the model aspect of this series. Back in the late 1980s, Takara produced a rather extensive series of 1/100 kits depicting aircraft from this series. It included the then-F-5G with a figure of Shin Kazama as well as an F-100, Yak-36 (sic), A-10, F-14, F-8, MiG-27 and Kfir, all planes of the 80s. These were superbly molded kits with fine engraved detailing. Most of them came with extras like the aforementioned figure and even weapons carts. Hasegawa, though its Creator Works department (which concentrates on anime/movie/game kits) has obtained the license for this series. There is a nice holographic Kadokawa sticker on the side of the box. This is apparently not the first time Hasegawa has released these kits with the first run being done in 1996. This is a 2017 boxing. So what is on the inside? 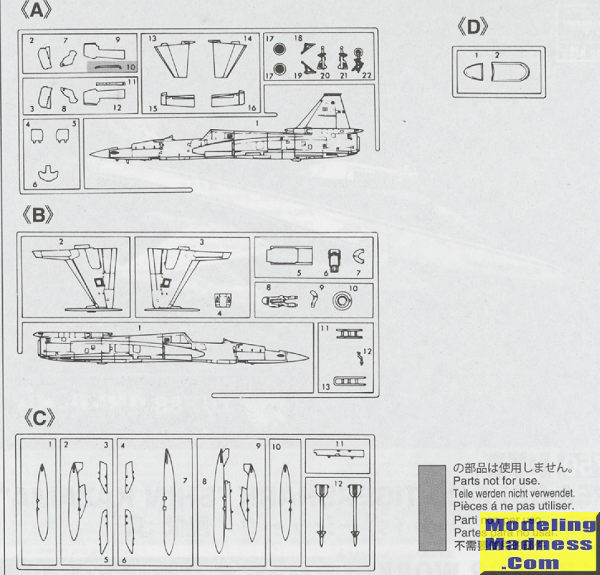 Your standard Hasegawa 1/72 F-20 and a new decal sheet. The kit itself has engraved panel lines, though these are a bit softer than what you'd expect of a brand new tooling. Cockpit is minimalist with decals for instruments. A pilot is provided and one should install it to hide the relative barrenness. One can pose the canopy open if one wishes and you have a boarding ladder. Some trimming is needed, especially if you do not want the speed brakes lowered. Wings are a single piece with pylon holes already drilled. The plane often flew without the tanks in the anime so it is your choice on how to outfit the aircraft. I have seen images where the outer pylons also carried Sidewinders. 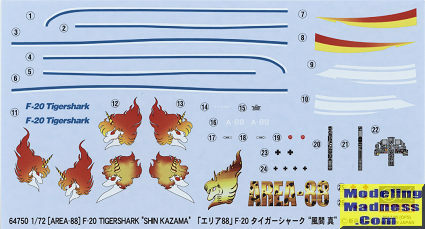 Instructions are the usual for Hasegawa, with Gunze paint references. Decals are well done and provide optional tail markings. There are also some that can be used on a display stand. You will need to do some masking for this one as the wings and a goodly part of the fuselage is white with dark blue on the rest of the airframe. The striping is included, but still requires some care with the original masking. I would use the stripes as a template to do the blue areas. You can easily scan them to provide a paper template for this. Not everyone's cup of sake, but I like things like this and the Tigershark is a neat plane. The masking requirements should not be too onerous if one is careful and the end result is something a bit different.